You are on the Men's Corral Boot Index Page. If you prefer the Ladies Corral Index page, Click here, or at the link at the bottom of this page. 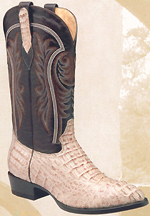 The pattern of this Caiman boot is enhanced by the patterns of the pulls, and lays of the shaft. Black color Caiman foot. Leather outsole on an all leather upper. Glove lining. J or R toe available. Slightly underslung walking heel. Handcrafted. Natural color Caiman foot. Leather outsole on an all leather upper. Glove lining. J or R toe available. Slightly underslung walking heel. Handcrafted. Burnt Apple color Caiman foot. Leather outsole on an all leather upper. Glove lining. R toe available. Slightly underslung walking heel. Handcrafted. Men's 8 - 12, & 13 are usually pretty fast too. Other sizes are usually made as the orders come in. Cognac (Peanut Brittle) color Full Quill Ostrich foot. 3 piece decorative vamp.13 inch top. Leather outsole on an all leather upper. Glove lining. Medium Round toe (R toe). Slightly underslung walking heel. Handcrafted. Bone color Full Quill Ostrich foot. 3 piece decorative vamp.13 inch top. Leather outsole on an all leather upper. Glove lining. Medium Round toe (R toe). Slightly underslung walking heel. Handcrafted. Black color Full Quill Ostrich foot. 3 piece decorative vamp.13 inch top. Leather outsole on an all leather upper. Glove lining. Medium Round toe (R toe). Slightly underslung walking heel. Handcrafted. Men's 6 - 12, & 13 are usually pretty fast. Other sizes are usually made as the orders come in. Orix (bone) color Full Quill Ostrich wingtip on a Smooth Ostrich foot. 13 inch top. Leather outsole on an all leather upper. Glove lining. Medium Round toe (R toe). Slightly underslung walking heel. Handcrafted. Genuine Ostrich leg is made from the thigh of the ostrich. This cut feels much like a lizard boot. Dressy. Ostrich leg is more scratch and stain resistant. The cut of the 3-piece vamp gives more distinction to your boot. By special request, each of these Ostrich Leg boots is available in optional SQ square toe, J - Narrow Round, or X - Handmade Pointed Toe styles as well as the R - Medium Round toes shown. Vintage Cognac color Ostrich Leg foot. 13 inch top. Leather outsole on an all leather upper. Glove lining. Choose from R, J, X, SQ toes. Slightly underslung walking heel. Handcrafted. Black Cherry (Burnt Apple) color Ostrich Leg foot. 13 inch top. Leather outsole on an all leather upper. Glove lining. Medium Round toe (R toe). Slightly underslung walking heel. Handcrafted. Black color Ostrich Leg foot. 13 inch top. Leather outsole on an all leather upper. Glove lining. Medium Round toe (R toe). Slightly underslung walking heel. Handcrafted. Grey color Ostrich Leg foot. 13 inch top. Leather outsole on an all leather upper. Glove lining. Medium Round toe (R toe). Slightly underslung walking heel. Handcrafted. Black / Brown color Ostrich Leg foot. 13 inch top. Leather outsole on an all leather upper. Glove lining. Choose from R, J, X, SQ toes. Slightly underslung walking heel. Handcrafted. Peanut Brittle (Cognac) color Ostrich Leg foot. 13 inch top. Leather outsole on an all leather upper. Glove lining. Medium Round toe (R toe). Slightly underslung walking heel. Handcrafted. Black color Teju Lizard foot. Leather outsole on an all leather upper. Glove lining. R (med round) Slightly underslung walking heel. Handcrafted. Bone color Teju Lizard foot. Leather outsole on an all leather upper. Glove lining. X Toe (Handmade narrow pointed). Slightly underslung walking heel. Handcrafted. Wine color Teju Lizard foot. Leather outsole on an all leather upper. Glove lining. X Toe (Handmade narrow pointed). Slightly underslung low walking heel. Handcrafted. Chocolate (sports rust) color Teju Lizard foot. Leather outsole on an all leather upper. Glove lining. X Toe (Handmade narrow pointed). Slightly underslung walking heel. Handcrafted. Peanut Brittle (cognac) color Teju Lizard foot. Leather outsole on an all leather upper. Glove lining. X Toe (Handmade narrow pointed). Slightly underslung walking heel. Handcrafted. Black / Brandy color Teju Lizard Wingtip foot. Leather outsole on an all leather upper. Glove lining. X toe shown (handmade narrow point). Also R, J, & SQ, Toes. Slightly underslung low walking heel. Handcrafted. Burnt Apple (black cherry) color Teju Lizard foot. Leather outsole on an all leather upper. Glove lining. J toe (Narrow round). Slightly underslung walking heel. Handcrafted. Buttercup color Teju Lizard foot. Leather outsole on an all leather upper. Glove lining. J toe (Narrow round). Slightly underslung walking heel. Handcrafted. Black color Stingray boots. Small Star on vamp. Leather outsole on an all leather upper. Glove lining. Medium Round (R) toe. Slightly underslung walking heel. Handcrafted. 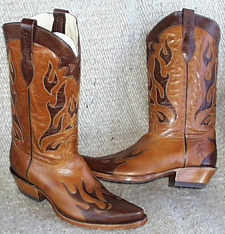 Chestnut color Stingray boots. Leather outsole on an all leather upper. Glove lining. Square toe. Slightly underslung walking heel. Handcrafted. 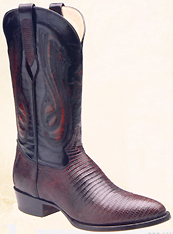 Chestnut color Stingray boots. Leather outsole on an all leather upper. Glove lining. Medium Round (R) toe. Also J, X, toes. Slightly underslung walking heel. Handcrafted. 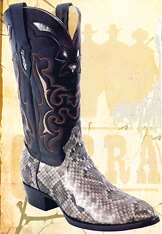 Python Boots and Western Diamondback Rattlesnake Boots give you a boot with an outer shell of snakeskin, over an inner shell of leather. This adds support and strength to your Western boots. Extremely form fitting to your individual foot's features. Almost no break-in period. 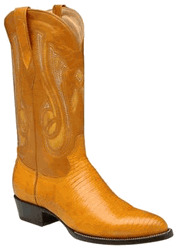 Natural color Western Diamondback Rattlesnake boots. Rattler Inlays. Extra Deep top dip. Leather outsole on an all leather upper. Glove lining. Square toe. Roper type walking heel. 11 inch top. Handcrafted. 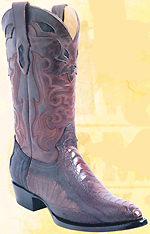 Natural color Western Diamondback Rattlesnake boots. Rattler Inlays. Leather outsole on an all leather upper. Glove lining. 13 inch top. Medium Round (R) toe. Slightly underslung walking heel. Handcrafted. Beige color Python Snake boots. Brown shaft. Extra Deep top dip. Leather outsole on an all leather upper. Glove lining. Square toe. Roper type walking heel. 11 inch top. Handcrafted. Grey Python boots. Python belly up. Brush off goat shaft. Leather outsole on an all leather upper. Glove lining. 13 inch top. Medium Round (R) toe. Slightly underslung walking heel. Handcrafted. Cognac Python boots. Python belly up. Brush off goat shaft. Leather outsole on an all leather upper. Glove lining. 13 inch top. Handmade pointed (X) toe. Slightly underslung walking heel. Handcrafted. Natural Python boots. Python back up. Black brush off goat shaft. Leather outsole on an all leather upper. Glove lining. 13 inch top. Handmade pointed (X) toe. Slightly underslung walking heel. Handcrafted. Natural Python boots. Python belly up. Black brush off goat shaft. Made for Cultured Cowboy. This is a "Best Seller" boot especially made for us. Leather outsole on an all leather upper. Glove lining. 13 inch top. Medium Round (R) toe. Slightly underslung walking heel. Handcrafted. Hand tooled leather boots. Cowboy floral pattern. Matching shaft. Leather outsole on an all leather upper. Glove lining. 13 inch top. Medium Round (R) toe. Slightly underslung walking heel. Handcrafted. 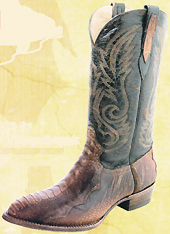 Hand tooled leather boots. Hand laced. Cowboy floral / flag pattern on shaft. Leather outsole on an all leather upper. Glove lining. 13 inch top. Special Square toe. Slightly underslung walking heel. Handcrafted. We liked this boot. But, from time to time changes are made. Don't miss your favorite boot. Order soon!